More than 1,000 overseas Chinese in Silicon Valley enjoyed their three-hour, laughter-filling time so much that they didn't leave their seats even after a Chinese arts troupe presented their closing performance on Saturday's Spring Festival gala. The star-studded party, a non-profit event to celebrate China's Spring Festival for overseas Chinese in Northern California, featured many Chinese golden oldies, a fashion show of the red Cheongsam (body-hugging one-piece Chinese dresses), comic skits, Xiangsheng (aka Crosstalk Comedy), and Chinese Kung Fu. Led by Chen Zhenglei, a key champion of the national intangible cultural heritage in China, five Tai Chi masters made a special appearance at Saturday's event as they were in San Francisco on their first stop of the China Tai Chi Culture World Tour. 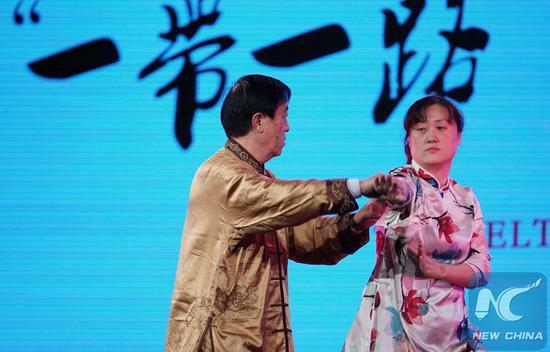 They made a demonstration show of both Chen-style and Yang-style Tai Chi -- two of the five traditional family styles of the 400-year-old martial arts, which drew a round of thunderous applause for their perfect performance of the Chinese Kung Fu. Wang Donghua, Consul General of China in San Francisco, said that Spring Festival is the most celebrated event of China, also a time for family reunions and the assemblage of friends. "The gala tonight is a really primary time of reunion that brought together the overseas Chinese in the Bay Area, particularly from the Silicon Valley, which is a special welcome created by the Chinese arts troupe," he said. "Culture, as a key part of the China-U.S. relations, plays an important role in enhancing mutual understanding and trust between the two countries and peoples," he said, adding that the gala is a significant step that helps to bring the two cultures closer in the new year of 2019. Many of the yesteryear songs triggered a bout of homesickness, said Yan He, one of the organizers of Silicon Valley Root-Seeking Camp, a non-profit group dedicated to help the younger generations of the U.S. overseas Chinese explore their home country. "The performance rekindles a familiar feeling deep in my heart, and many of the second generation of overseas Chinese, mostly born in the United States, have only a limited knowledge about China and Chinese culture," she said. "The event like Saturday's gala can have a subtle but invisible, persistent impact on the second-generation Chinese Americans in developing a sense of identity about the Chinese background rooted in the culture of the home country of their parents," Yan explained. Yan Zhao, a newly-elected Chinese American council member of Saratoga city in Santa Clara County of Northern California, said she has lived in the United States for more than 30 years, but that it was still exciting to watch the high-quality performance by the Chinese artists. "Culture is the best bridge to increase understanding and communication between peoples while it decreases hostility... For both China and the United States, culture matters in their communication," she said.